Quickliner for Eyes Intense is a soft pencil eyeliner that doesn’t require sharpening. You just twist up a little bit of the pencil at a time (but not too much so it doesn’t dry out). On the opposite end is a sponge tip for smudging that definitely comes in handy. The Intense version of Quickliner comes in seven shades. I purchased Intense Ebony, a super inky black. Ophthalmologist tested, Quickliner is safe for sensitve eyes but, based on other reviews I’ve read, may not be recommended for contact lens wearers. The Good: I’ve never experienced such an intense black from a pencil eyeliner. The pencil is soft, so there’s no tugging when you apply. It works especially great when applying to the waterlines of your eyes. Once applied, you have about a minute before it dries and sets (try not to blink!) to a smudge-proof finish. For maximum definition, I like to apply this liner after I apply my eyeshadow. Before it sets, I use the sponge tip to blend it in. The Bad: Since it’s a non-sharpening eyeliner, you don’t have the benefit of a pointy tip to apply a sharp, fine line. As Clinique demonstrates in their online video, you’ll want to keep some cotton swabs nearby to clean-up and define your lines. Also, because the pencil is so soft, you’ll go through a lot of product in a short amount of time. 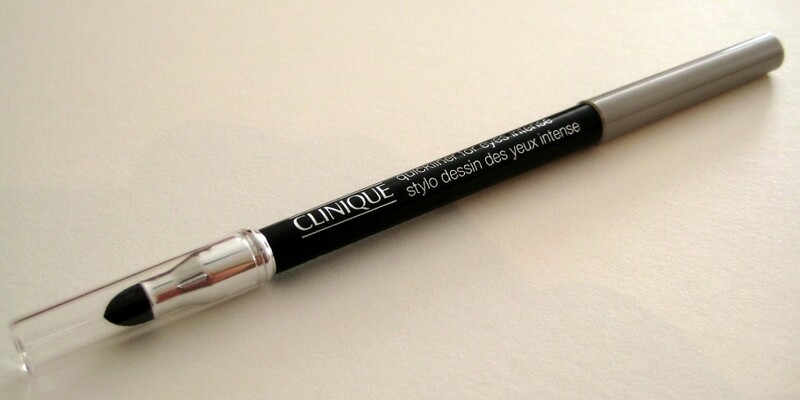 The Verdict: Clinque Quickliner for Eyes Intense is a winner. It’s perfect for creating a defined black line along the inner rims of your eyes or achieving a smoky eye. However, if you’re wanting to achieve a winged-eye look, I think you’ll be better off with a liquid eyeliner. With a very reasonable price point of $15, I’d say this is a good pencil eyeliner choice for anyone looking for long-lasting, intense color.